Slightly more than half the country approves of President Obama's $800 billion-plus stimulus package, a new CBS News poll finds. But support for the bill has fallen 12 points since January, and nearly half of those surveyed do not believe it will shorten the recession. 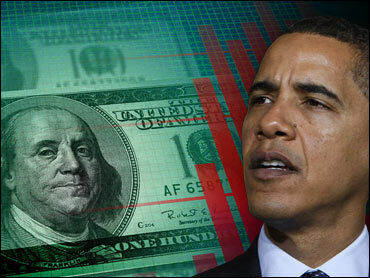 Fifty-one percent of those surveyed support the stimulus package, while 39 percent do not. An additional 10 percent don't know. Last month, 63 percent supported the package and just 24 percent opposed it. Americans believe the president is following through on his promise to establish greater bipartisanship in Washington: The public overwhelmingly thinks Obama is reaching out to Congressional Republicans, with 81 percent saying he is doing so. Americans do not believe that Congressional Democrats and Republicans are following suit, however: Only 49 percent believe that Congressional Democrats are striving for bipartisanship, and just 41 percent say Congressional Republicans are seeking bipartisanship. 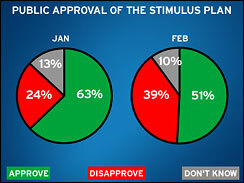 Eighty-one percent of Americans say the stimulus bill should be a bipartisan effort. Just 13 percent think it is okay for a bill to be passed with only the backing of the Democratic majority. There are signs that Americans are receptive to Republicans' push to increase the proportion of tax cuts in the stimulus bill: Asked whether higher government spending or tax cuts for business would be more effective in ending the recession, 59 percent choose the tax cuts. Just 22 percent prefer more government spending. The approval rating for Congressional Democrats is 48 percent, while the approval rating for Congressional Republicans is 32 percent. Democratic Speaker of the House Nancy Pelosi is unknown to most Americans, but she gets a 3-to-1 negative rating from those familiar with her. The public is not optimistic about the impact of the economic stimulus bill: Just 21 percent believe it will significantly shorten the recession. An additional 18 percent believe it will shorten the recession slightly. Forty-five percent say it will not shorten the recession at all. Americans are also pessimistic about the economy and their prospects in it. Forty-four percent are very concerned that they or someone in their household will be out of work and looking for a job sometime in the next twelve months - an increase of 14 points from last month and the highest number since CBS News began asking the question in 1996. Another 28 percent are somewhat concerned. And nearly all Americans - 94 percent - think the economy is in bad shape. That's the highest number in the more than two decades CBS News has been asking this question. Only 5 percent say the economy is good, an all-time low. Fifty-one percent say the economy is getting worse. More than half say the recession will last two years or longer; an additional 30 percent say it will last one year, while nine percent expect it to last six months. Sixty-eight percent of Americans think the country is on the wrong track. They are more optimistic than they have been, however: The figure is 11 points lower than it was before the Inauguration, and 21 points lower than it was last fall. Twenty-three percent now think the country is headed in the right direction - up eight points from just last month and 16 points from an all-time low last October. Americans continue to be divided on the idea of the government providing money to the nation's struggling banks and financial institutions, but slightly more now disapprove (47 percent) than approve (42 percent) of the idea. In December, slightly more Americans approved of the bank bailout than disapproved. More than half of Americans believe the federal government should decide how government money given to financial companies should be spent. Just 27 percent believe financial institutions should decide. The public does not want the government to own banks, however: Just 14 percent say the government should own and control banks, while 76 percent say the government should not. President Obama has ordered the detention facility on Guantanamo Bay, Cuba, shut down within a year. Americans are divided on the question. Forty-four percent agree that the facility should be shut down, while slightly more - 46 percent - think it should be kept open. Thirty-six percent say closing the detention facility will make the United States less safe from terrorism. About half think closing it will have no impact, while four percent think closing the prison will make the U.S. safer. About a quarter of Americans who want the prison closed cite concerns about the treatment of prisoners: that they are being tortured, having their human rights violated or are being otherwise mistreated. Sixteen percent think it is simply a waste of money, while 13 percent think closing the facility will improve the image of the United States and its relations with the rest of the world. 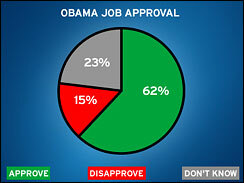 This poll was conducted among a random sample of 864 adults nationwide, interviewed by telephone February 2-4, 2009. Phone numbers were dialed from RDD samples of both standard land-lines and cell phones. The error due to sampling for results based on the entire sample could be plus or minus three percentage points. The error for subgroups is higher.